It's in the 51cm (Small) size. It came almost fully assembled and set up from a UK online retailer and I just had to reattach the handlebar, fit the front wheel and add some pedals. Currently I've taken the Crank Bros Stamps 7s off my MTB and fitted them on to get the bike operational. I managed to get a cracking deal on a closeout sale so this proved to be far better value than the Cervelo C3 that I almost bought. I need to fine tune the Di2 at some point. I've seen the di2 model listed for $2600usd online and thought its a solid deal for full carbon and Ultegra di2. nice find for sure. 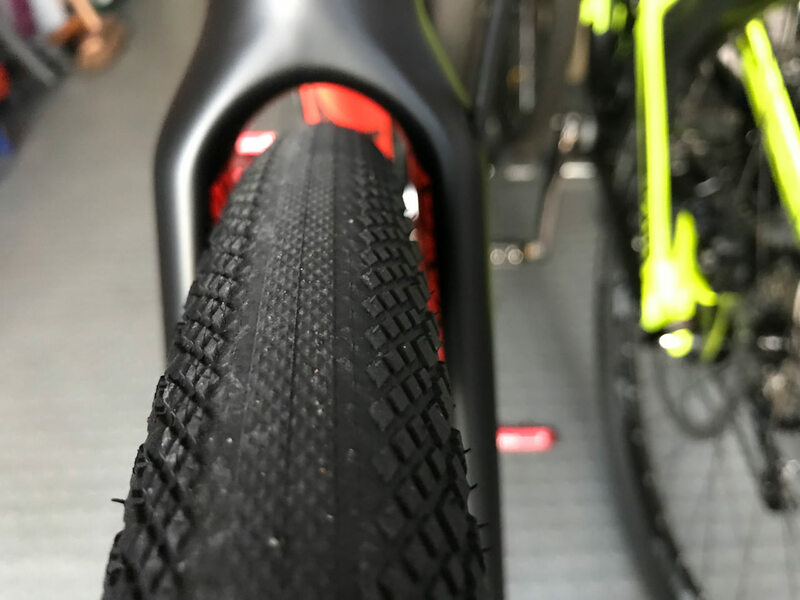 Is the 38mm tire pretty much the max size? I like the stripes of orange to break away from the current trend of matte black. And the orange letter b repeating on the fork is neat. just saw the 220# weight limit per company. Ouch- a reminder that I need to drop a bit to apparently ride carbon. The EX model is the $2600 one. 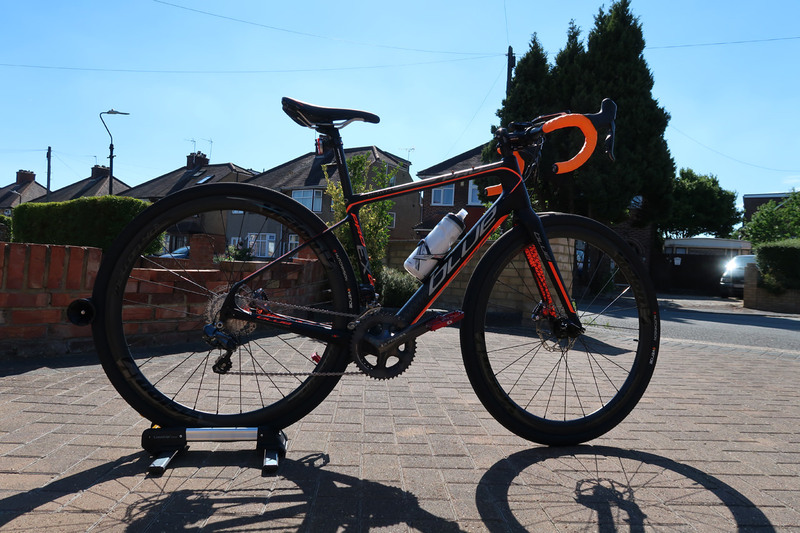 It’s a slightly different bike to this one (which is the EX-Gravel). Some of the components are different (e.g. the wheel sets) but both are Di2. 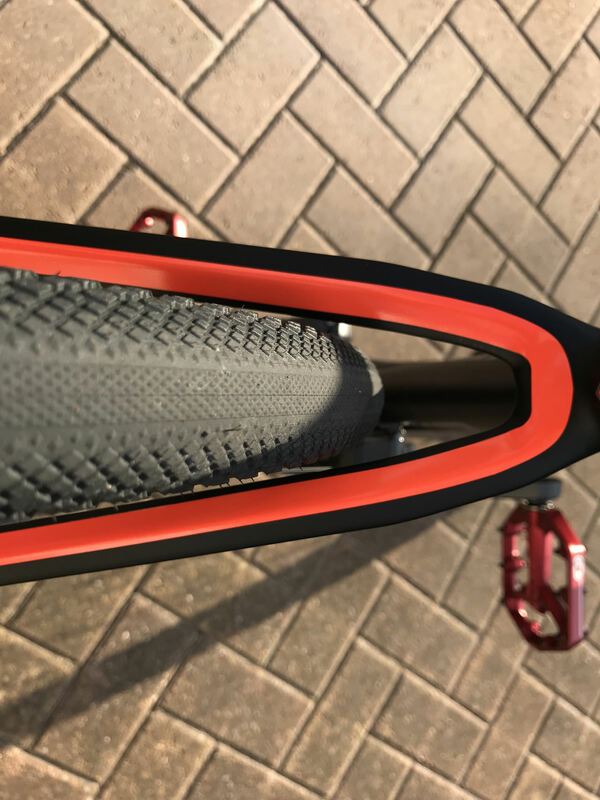 The bike comes with 38mm tyres and clearance looks tight. I’ll check more carefully tomorrow on you could get away with. fantastic ride I used to have a Blue road bike, I really loved that bike. this will be a great ride for you. It needs dirt all over it. Now, ride the heck out of it! ...And appreciate the irony of having a "Blue" branded bike that isn't. 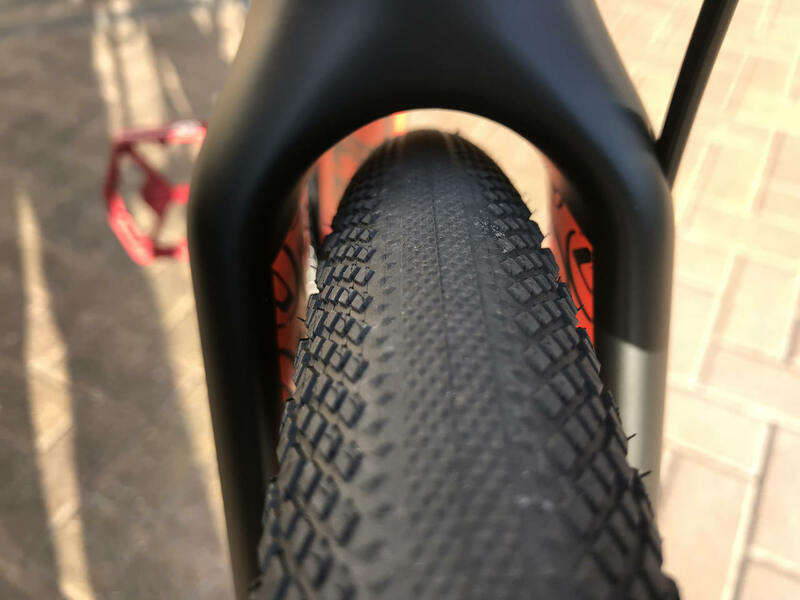 Curious to hear your thoughts on the tires when you have some miles on them. Nice looking bike, I hope you enjoy it. I don't know if it's just me, but it seems like when I ran a mechanical group, it would get gunked up in the rain and just not shift as well. I've never had that with Di2. On nasty muddy dirt and gravel roads, it's flawless every time. Have fun with yours! RBP has some carbon Prosecco models on clearance with mechanical discs. With the discount code save10 the 105 version is $916 and the Ultegra is $1181. They have the same model as the OP in a 60cm for $2504 with the code. Last edited by Lazyass; 08-01-18 at 10:05 AM. Some good deals there. Just be aware that the manufacturer is totally unresponsive on social media so it looks like these are stock clearances. If you're happy to have a bike with little or no support from the manufacturer, but bikes with great components, then these are excellent deals. What's the max tire clearance? Looks pretty good in the front. Looks like it can possibly run 42 in the front. How about the rear? I’ll take some better pics tomorrow of the front and rear. Nearly midnight here in the U.K. now! It looks tight in the rear, I doubt you could go bigger. The website says it has clearance for 38's. It would be fine with me personally, that's a sweet bike. Thanks I appreciate it. I am on the fence regarding this bike and there aren't very many reviews on it. For those interested in clearance on this bike, I'm afraid 38 is probably the max. 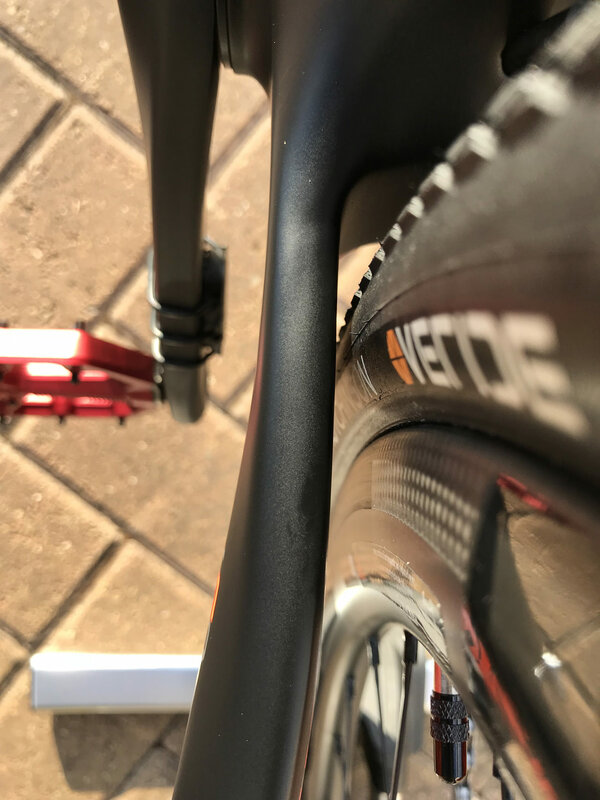 Here's the front fork clearance, which might be okay to go a little higher. Stock tyres are 700x38. In summary, I don't think you could get wider than 38 on the rear. Thanks for the pics - how does it ride? I’m still in setup and test mode. I spend a few hours after work every evening getting it set up how I want and doing very short test rides. The handlebar is very compact, i.e. narrow. I’m getting used to riding drop bars and the new body position. 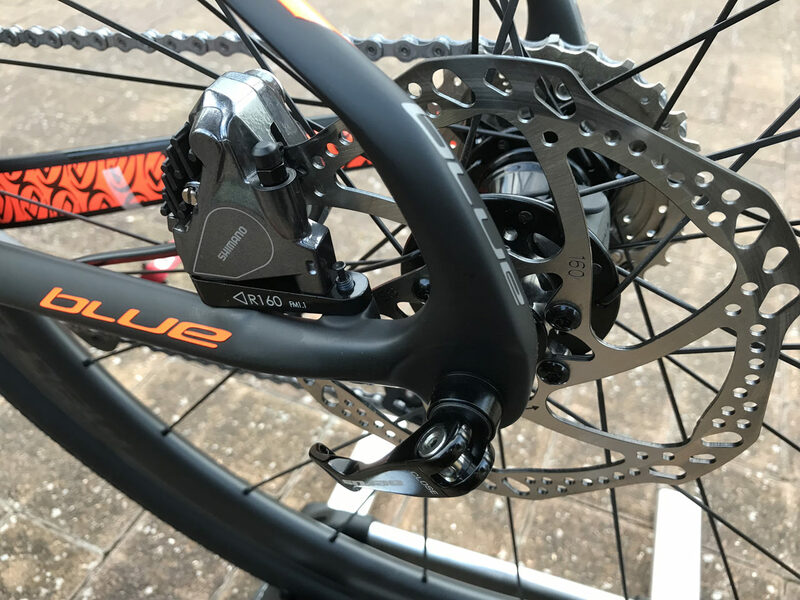 So far I’ve indexed the gears - very, very easy to do with Di2. I’ve spent quite a bit of time getting the saddle height and tilt close to what feels good and this needs a bit of tweaking. I’ll be getting the brake lever free play and reach set up soon. The brakes have phenomenal stopping power. 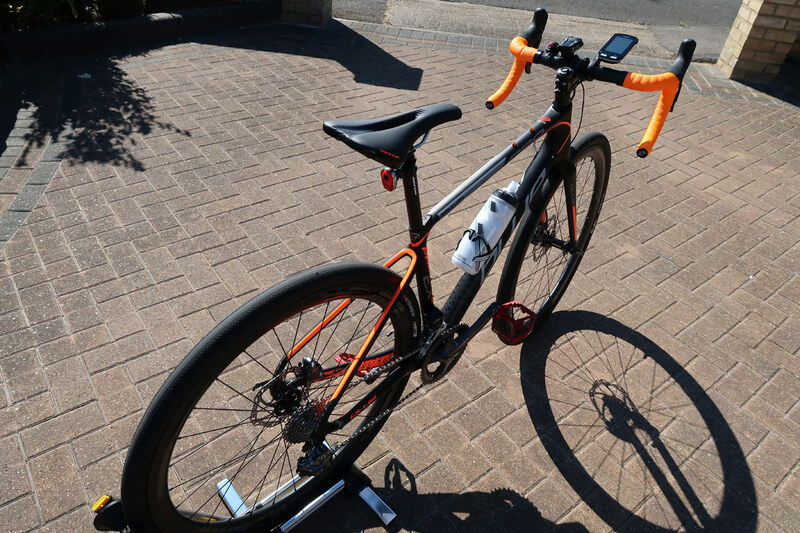 The bike is quite light and feels stable and planted on the road surface. It’s quite easy to pedal and gear changes are very smooth and fast. I can only compare it to my previous Roubaix SL4 Comp Disc road bike. It’s definitely less twitchy. 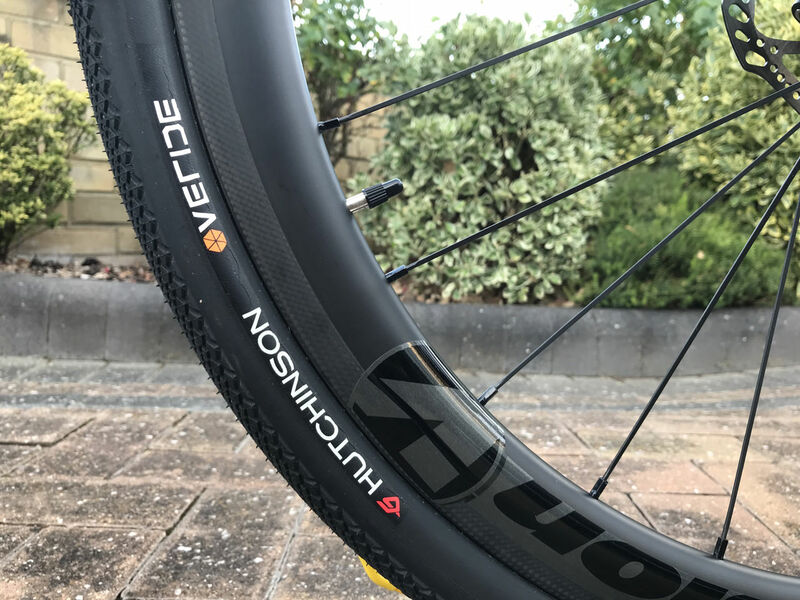 Comfort-wise, and based on very limited test rides, it feels a little smoother, but this may be down to the wider tyres. I’ll be doing my first proper rides over the weekend so will have a better idea of the ride quality soon. I like the top tube bag mount. Wish more bikes had them. If anyone's considering buying this bike then here's a first-ride review. I only have my previous carbon Specialized Roubaix Comp Disc to compare to as the Roubaix was a road bike. Firstly, the Roubaix felt a bit lighter. 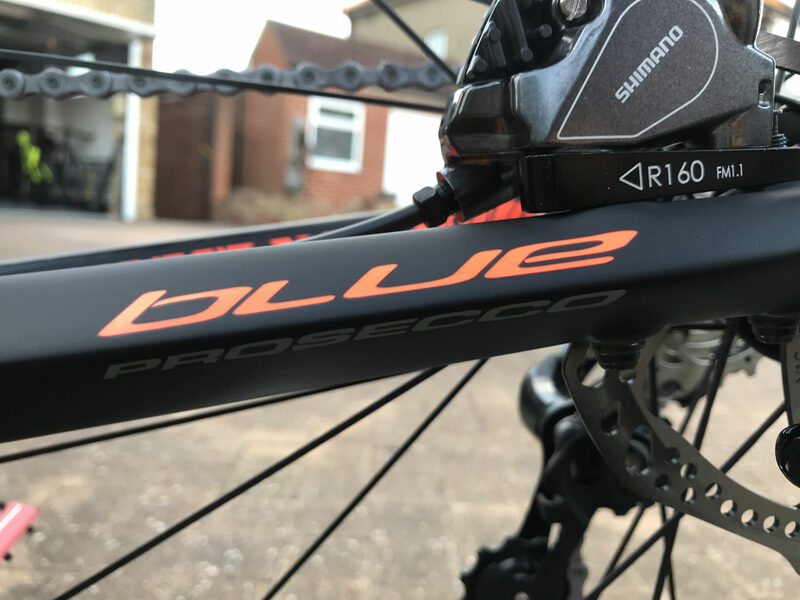 This may just be feel though as the Blue Prosecco EX-Gravel Di2 bike weighs 9.20 KG (= 20.28 lbs) with the following accessories installed on it: front light, rear light, bell, bottle cage. So, not too heavy for a gravel bike. 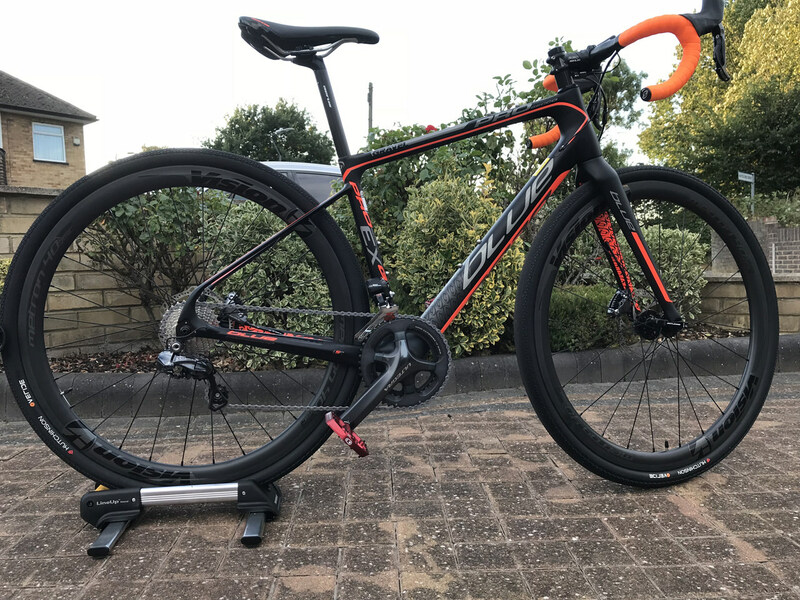 My 2016 Roubaix SL4 Comp Disc was 9.80KG. Since I bought the bike I've removed the factory stickers on it, installed the above-mentioned accessories and updated the Di2 software. I've also reset the brake pads and adjusted the brake lever free play and reach. All of this was so much easier to do as the bike has standard off-the-shelf parts for drivetrain and brakes, so I could download the Shimano manuals easily enough. For initial tyre pressures I chose 70 PSI at the rear, and 60 PSI at the front. The tyre pressure range is 43 PSI to 80 PSI. Compared to the Roubaix, the Prosecco seems more sure-footed and a little less twitchy. The Di2 gear changes are sublime. Braking is astonishing and at least on a par with the Roubaix. Steering is slightly more relaxed. 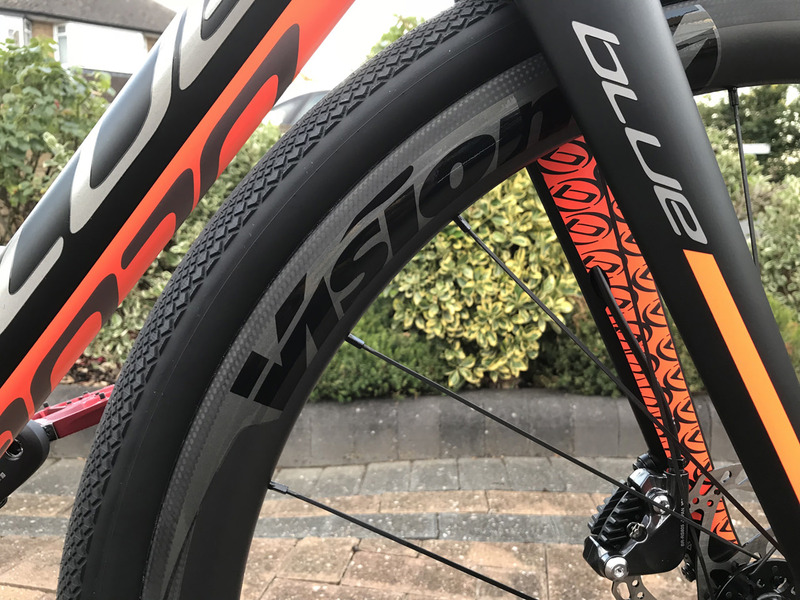 The overall feel instills confidence and grip from the tyres on tarmac and cycle paths is reassuring. I didn't try to go fast as I wanted to get adjusted to the bike but there is plenty of potential for some decent pace. It's a very quiet bike to ride and feels silky smooth. In fact, I prefer the ride quality of the Prosecco compared to the Roubaix, which had the excellent CG-R seatpost and Zertz frame inserts. I found the Prosecco to glide along better and this may be down to the wider tyres with lower pressures. The FSA SLK Carbon handlebar soaks up road buzz quite nicely and my hands never went numb or got tired. The handlebar is very compact so will take some getting used to. The saddle was actually fine and I hardly noticed it during the ride, although I think it needs to be moved back a touch. 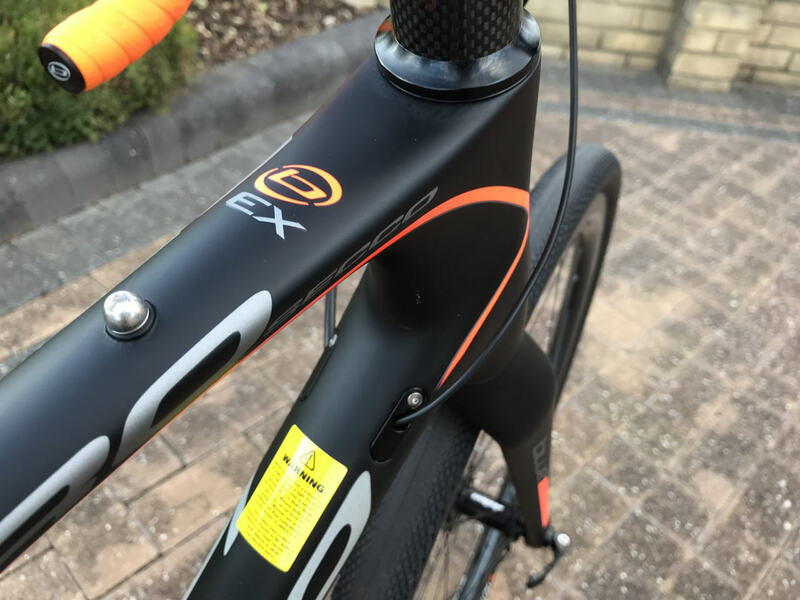 A Specialized Romin Evo Expert Gel saddle will replace the stock saddle in a few days time. I was using Crank Brothers Stamp 7 flat pedals so grip was extremely good and my shoes (regular gym trainers) never slipped off once. Here in the UK the roads where I live are quite terrible and I noticed that the Prosecco was able to cope with the bumps and dips very well. The only time it felt out of its league was when I intentionally rode along a ribbed painted line that separates the walking lane from the cycling lane. The ride was quite jarring but then any bike would struggle - even my fatbike struggles on that painted line. Slowing down and stopping, and remounting was very easy on the bike. In terms of build quality, the frame feels quite strong and more robust compared to my previous Roubaix. The finishing kit is excellent for the price I paid. At no point did I think something was going to break, despite riding over small potholes in the road. In fact, with the meatier tyres, I didn't have to worry too much about what I rode over. Here in the UK it's not unusual to find broken glass on cycle paths. 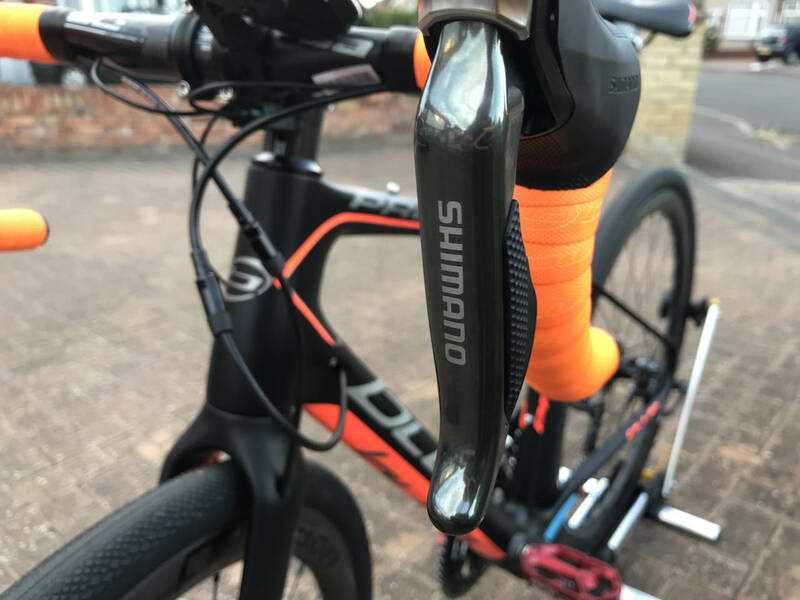 Some bad points: the handlebar is extremely compact width-wise. It already feels cramped with a small bell, a tiny light and my Garmin cycle computer. I guess I'll get used to it. 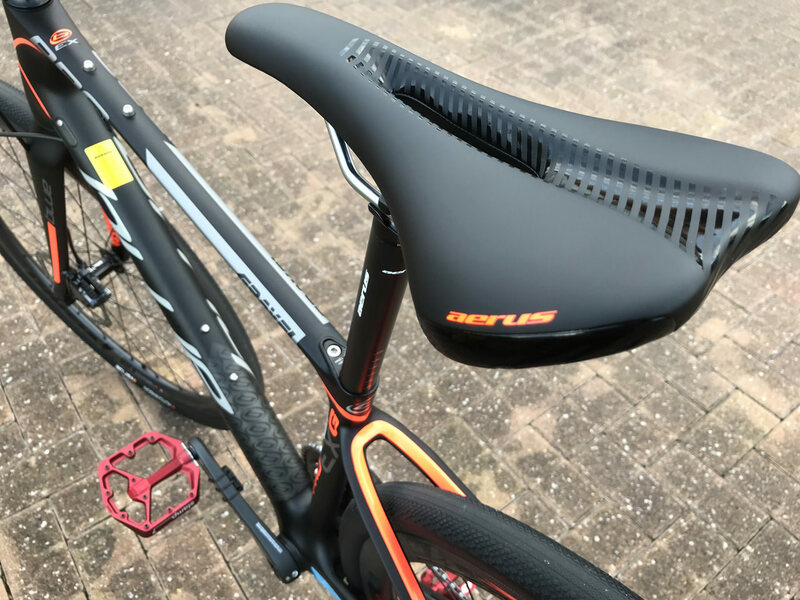 Saddle height and tilt makes a very big difference to ride quality (this is fairly common though). The bike has a 99KG weight limit - not an issue for me as I'm well under that weight limit, but may be an issue for heavier riders. Last edited by taz777; 08-05-18 at 11:03 AM. I'll post some pics of my bike when it comes in. I literally just bought it yesterday and waiting for it to ship. There will be a list of things to swap out for me which should keep me busy enough till next spring. After the seat/post the first thing will be wheels and a slightly bigger cogset in the back (30t). 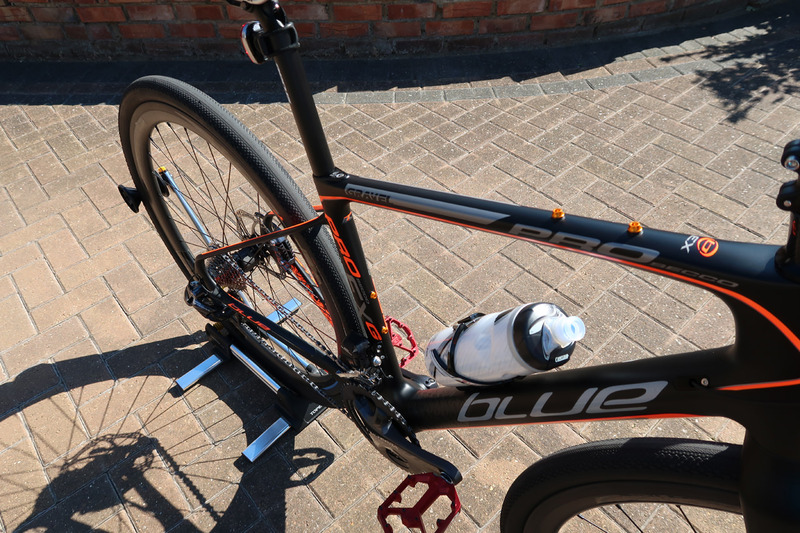 Then onto carbon in the cockpit and upgading to hydraulic brakes. I'll see if we can keep this thread going as I make changes and it'll be a reference for this obscure bike. Try reducing the tyre pressure, and comfort will increase dramatically. That's the point of big tyres! If you're only riding on asphalt try 40-45 psi but even that's a bit too high. For offroad use you can go down to the 30-35 psi range but you have to be careful because it will be easy bottom out the tyres on stuff like roots and big rocks. Im curious to see how 650b's fit on this bike. Might give you a little more clearance for wider tires. 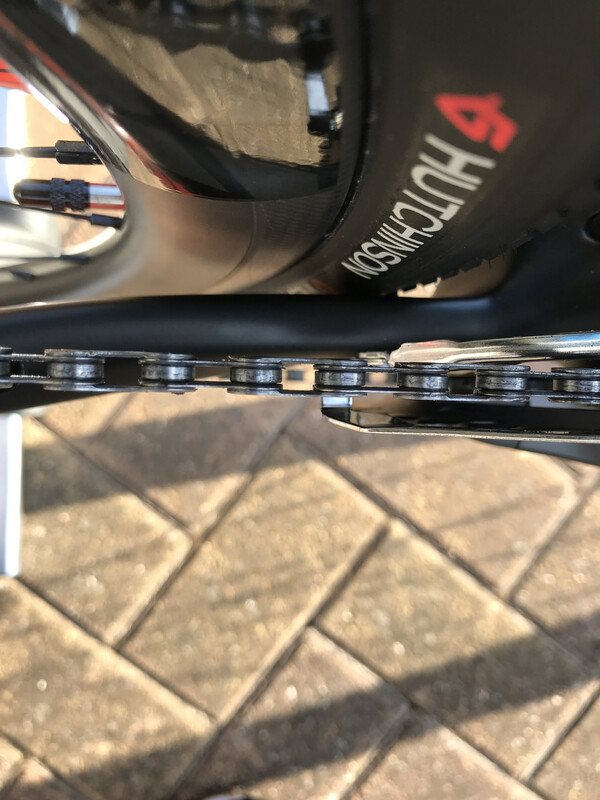 Id be concerned about the crank length though with the low BB drop. Its 7cm on this bike where as most cyclocross bikes are at 6. If you throw the 650s on your bike, take some pictures and let us know. Im hoping to get a set of fenders on this thing for the wet winter riding here in the PNW and the extra clearance may help. Any updates since this last post? Still loving the bike. Experimenting with tyre pressures after another poster on here recommended lowering the pressures. I've only got a handful of rides on the bike so far but every ride is thoroughly enjoyable. What's impressed me most is just how comfortable the bike. My new saddle (Fizik Aliante R3 Open) is contributing to the comfort. 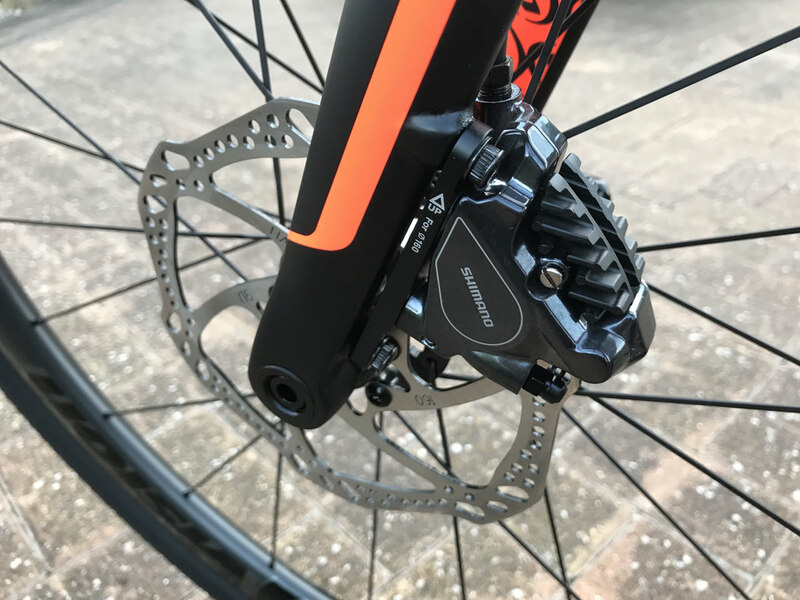 The brakes are still by far the best brakes I've ever had on a bike (even better than the SLX M7000 brakes that I had installed on my fat bike). My only gripe is the very narrow handlebar as I have very broad shoulders so could do with a bar that's a few inches wider.